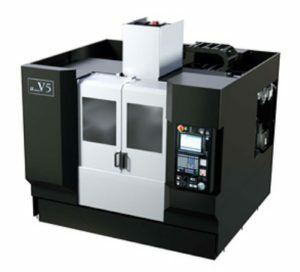 Mitsubishi Heavy Industries Machine Tool just launched the micro V5 micro milling machine, the latest in its micro V series. The micro V5 has a bigger working surface table and wider process stroke than the current micro V1, allowing for high-efficiency machining with micrometer-level (1/1,000 mm) precision for large products or those that require fine milling using small diameter tools, such as molds for car optical components. The micro V5 meets demand for a wide range of applications such as precision automotive parts, large-scale molds for display casings and other products, separators( (the main component of fuel cells), and shaping blades for rotating machines. The micro V5 continues the high standards of precision established by the micro V1, developed and launched in 2006 for machining of precise dies and molds, electrodes, and precision parts. The newly developed 30,000 RPM high-performance spindle incorporates a special jet lubricating system that circulates lubricating oil warmed to match the frame temperature to the internal part and outer casing of the spindles. The machine has a high rigidity symmetrical frame, with an optimal structure for heat resistance and machine rigidity, while providing high attenuation with slide guideways for each axis, offering the best machined surface quality for a wide variety of materials. Thorough cooling of each heat source also minimizes thermal displacement, allowing for stable operation over long periods. The primary spindle used in the micro V5 is a high-speed, high-performance wide range spindle, which also ensures high precision with little thermal displacement. Further, Mitsubishi Heavy Industries Machine Tool’s proprietary Optical Image-type Tool Measurement System can accurately measure the position of the rotating tool end using a high resolution CCD (charge coupled device) camera, allowing for tracked precision machining even for cuts with micrometer-level accuracy. The working surface of the table is 1,050×550 mm, and can accommodate large workpieces of up to 800 kg. The micro V series lineup includes the three-axis micro V1, and the five-axis micro V1-5X machine with a tabletop inclined spindle and rotating spindle, expanding the range of applications to include cutting of non-ferrous materials, and producing various types of small tools. The lineup is highly regarded for low downtime and minimal deterioration in precision over time, as well as the proprietary Optical Image-type Tool Measurement System. The introduction of the micro V5 allows for precision machining of larger products. Mitsubishi Heavy Industries Machine Tool announced the micro V5 at a private showing held at its Ritto District Main Plant on February 2 (Thursday) and 3 (Friday). 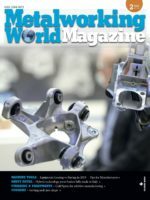 The company used demonstrations of die and mold machining to present a wide variety of precision machining solutions, and going forward will further expand the range of applications with the addition of spindle variations.